The Daleks’ Master Plan is one of those mystic First Doctor Dalek epics that whisper to modern fans from across five decades, dazzling with their scope, their wider Dalek universe and their breadth of invention. It’s worth mentioning before we go much further that it’s a story which, in this iteration – the full soundtrack of the episodes, with additional scene descriptions by Peter ‘Steven Taylor’ Purves – has been previously available in other formats, both individually and in the second Lost TV Episodes box-set of CDs. What this vinyl release has to offer in addition at first looks like it’s mostly style and prettiness. Ohhhh, but such prettiness. Orange… vinyl. Say that over and over in your mind, and think about exactly how cool it would be to have The Daleks’ Master Plan pouring our into your room on a vinyl release, complete with all the hi-fi lo-tech audio quality gubbins that vinyl connoisseurs enjoy, while orange vinyl discs slowly rotate on your turntable. That’s a thing right there. In fact, that’s a big thing – hearing a classic story from the black and white era on technology that was around in the days when the story aired adds a certain extra cool to the experience. Whether it adds almost a hundred pounds worth of cool is a question to which we’ll return in about…thirteen episodes’ time. The Daleks’ Master Plan is a 13-episode single-story arc, which is notable for a lot of reasons. It’s the first and so far technically only story to include an episode in which the Doctor isn’t mentioned anywhere (yes, yes, there were episodes in which the Doctor didn’t appear, but he’s always thought of as being there). Having left previous companion Vicki behind at the end of The Myth Makers, The Daleks’ Master Plan picks up three potential companions, and then – massive spoiler alert, but it has been over fifty years(!) – kills them all, a gorefest in Team Tardis terms that was unlike anything that had gone before, re-elevating both the (ahem) power and the evil of the Daleks, and consequently bringing home to viewers for the first time that maybe, just maybe, time-travelling with the Doctor wasn’t the safe little joyride it could sometimes seem. The Daleks’ Master Plan is also, of course, stark raving bonkers at several points, including the notorious Feast of Steven episode which involves comedy coppers, Keystone cops and a monstrously fourth wall-breaking merry Christmas to all of you at home. For all these reasons and more, The Daleks’ Master Plan is a unique story in the annals of Doctor Who. Plus, did we mention the orange vinyl? Mission To The Unknown, the Doctor-free episode is, in itself, entirely divorced from the Doctor Who universe. As a prologue to the main event though, it gets a lot done. Special Space Service agent Marc Cory, trapped on the planet Kembel, encounters deadly, people-eating Varga plants, witnesses (or in some cases, causes) the death of his crew, and sends a message out into the universe before he is exterminated with extreme prejudice by quite possibly the gothiest, most teenage bunch of Daleks in Who history. Seriously, the Daleks in Mission To The Unknown sound like they’re muttering ‘But, Muuuuuuuum…’ before every command accepted and every extermination attempt. It’s all rather gloriously sweet. What Mission To The Unknown ultimately is is a twenty-five minute pre-credits sequence for the Master Plan Proper, but in that capacity, writer Terry Nation makes sure it does what it needs to do – it tells us there’s a Dalek plot in the offing, that Earth, the solar system, the galaxy and the universe (the whole story is notoriously lax in its use of these terms) is in danger, and that Earth’s forces need to be deployed if there’s any hope of survival against the Dalek threat! And – cue the Master Plan. Or rather, in a moment of supreme creative daring, cue The Myth Makers(!). Mission To The Unknown, a precursor to the Daleks’ Master Plan, was actually followed on transmission by the four episodes of The Myth Makers, which saw Vicki stay behind in ancient Troy, and which presumably must have confused the bejesus out of audiences. Needless to say it makes a lot more sense here, connected by the flip of a disc to the rest of the story for which it’s ultimately a prologue. The Daleks, it seems, have grown tired of their usual ‘storm in and kill everybody’ tactics, and in this story, they give the first real inkling of their potential for sneaky long game genius, forming an alliance of misguided wrong ’uns to attack whole galaxies (or solar systems, or planets) at a time with a Big Old Superweapon – the Time Destructor. Naturally, the Big Old Superweapon has a Big Old Snag associated with it. It needs a relatively large amount of an insanely rare mineral element to make it work. Without a ‘full M’ of ‘Taranium’ at its heart, the Time Destructor’s just an awfully large paperweight. Step forward then, Big Chief Wrong ’Un Mavic Chen, Guardian of the Solar System (Side note – does that mean he’s now been out-guardianed by a talking raccoon and a walking tree? ), played by legendary bad guy actor Kevin Stoney. Chen’s been secretly mining the Taranium for the last fifty years, which in itself shows some fearsome forward planning, and now, bored of only governing one solar system, he’s ready to throw in his lot with the Pepperpots of Doom, but only on the understanding that he’s the Big Noise in the Alliance of Intergalactic Gittery. The Doctor, Steven and Katarina, handmaiden of the Trojan prophetess Cassandra, stumble quickly across the Dalek plot, and at least the Doctor and Steven spend the next twelve episodes running away from, trying to thwart, double-crossing, triple-crossing and ultimately Time Destructing the Daleks to stop the Master Plan from coming to its deadly fruition. The thing you need to understand about Terry Nation Doctor Who scripts is that they’re frequently sparked in genius, but equally frequently look and sound as if they’re plotted and paid for by the episode, so there’s an issue or a situation in each episode, and you’re desperately trying to get to the resolution of that particular issue, which might, if you’re lucky, advance the story somehow. So there are episodes here where the main issue is getting control of a spaceship, episodes where the issue is escaping from space convicts, episodes, as mentioned, where there are comedy British coppers, Keystone cops on a movie set, and a pause for Christmas drinks, episodes which see the return of the Meddling Monk, in ancient Egypt, double-crossing the Daleks, and more. That gives the Master Plan the feel of being actually quite exciting on an episode-by-episode basis, and a bit nuts if you try and take the longer view of it as a single, coherent story. As well as the startling lack of spatial precision, with galaxies and the universe being frequently swapped back and forth to mean ‘all the space you see’ as the area of potential Dalek conquest, it’s been well documented that as time went on, William Hartnell suffered more and more with an inability to remember the great number of lines given to his character, and there are some classic ‘fluffs’ here – when Katarina describes him as a god, he tells her gruffly ‘I am not a Doct…I am not a god…’, when sense seems to abandon him mid-sentence, you get declarations like ‘If the Daleks are doing…something drastic, then we must stop the Daleks!’ and at one point he describes Mavic Chen, perhaps understandably, as ‘Magic Chen’ – but more than that, there’s a sense in this long and convoluted story of Hartnell getting by significantly on the gestures and caricatures that we think of as fundamental to his Doctor to this day. There are lots of ‘Hmm? What?’ moments, a bushel of ‘Hmm, yes, quite, my boy, quite’ moments and a half-ton of general nods and humphs of approbation or irritation, depending on the need of the scene. Nevertheless, he also bring the powerhouse Doctor to some critical moments, especially in the wake of Katarina’s death, which, as you’d expect given it’s the first time a companion has died in his company, is given solid weight and poetry, Hartnell’s delivery demanding – probably against the constraints of recording time – that the moment be marked as a real thing. The Daleks’ Master Plan is epic and nutty and glorious and illogical (you might not from any other source remember the bit where Steven’s trapped in a personal force field after trying to con some Daleks, and the Doctor comes up with a plan to get him shot by Daleks to break him free, for instance! ), but overall, the sum of its parts is what will drive you on here. Each individual episode is involving and for the most part paced like a laser beam, even if the overall story arc seems to be mostly ‘Let’s stop the Daleks by stealing their battery.’ Stoney’s performance as Mavic Chen is positively Shakespearean, frequently seeming oddly theatrical, but heightening the sense of the man living in a rarefied atmosphere composed mostly of his own ego. Nicholas Courtney as space cop Bret Vyon gives what is basically an audition for a role as a capable friend of the Doctor’s, and Jean Marsh, coming in as Sara Kingdom, pivots quickly from the hardline Special Space Service officer to a potential companion, only to go out in a blaze of duty that’s tinged with justice and regret at the end of the story. Here’s the thing though. As we said all those words ago, this story, in this version, has been available on CD before now, but there’s something extra you get from playing it on vinyl, besides the awesomeness of orange discs slowly turning, painting you the story. On CD, you could carry it round with you while you went jogging or while you sat in a coffee house checking Facebook or some such. On vinyl, you can’t do that. You have to almost re-enact the constraints of watching it live – you have to sit there, in real time, while it plays out and colours its way into your brain. 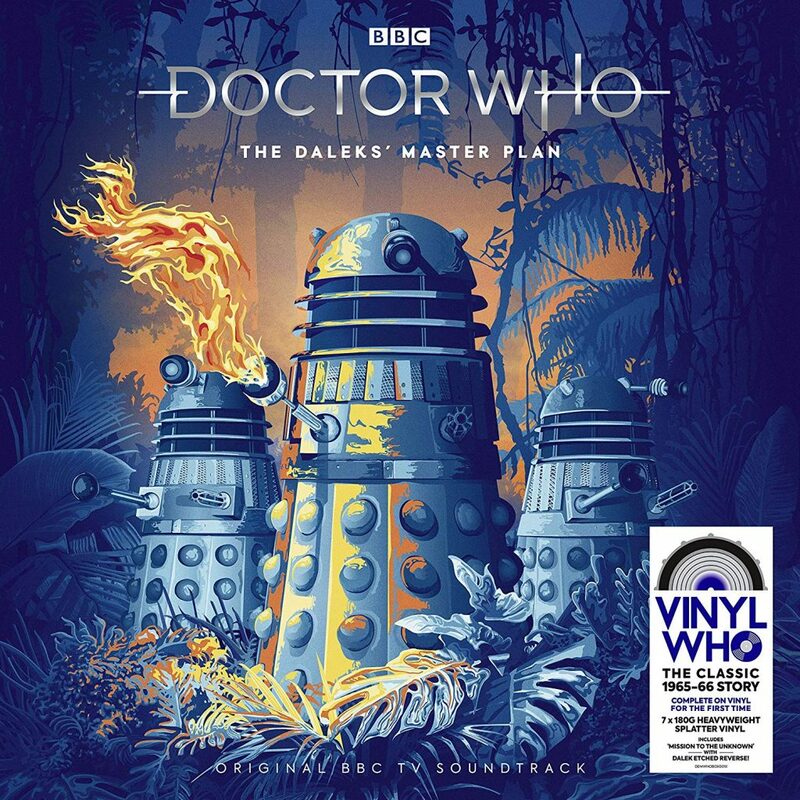 You have to check out, switch off, and engage with it on vinyl, and that very non-portability makes the vinyl release of The Daleks’ Master Plan something absolutely extra special. The story’s mad and epic and intensely plotted by episode, but barring the discovery of a lot of missing episodes or an animation budget that would probably break the bank, the vinyl release of The Daleks’ Master Plan is about as authentic an experience of this Sixties classic as you’re going to have in your lifetime.